Despite, Kobe’s impending return to the NBA, this is the biggest game in tomorrow’s slate as the East-leading Indiana Pacers take on the Oklahoma City Thunder. Indiana holds the best record in the NBA at 18-2 and have been the league’s most dominant team defensively. They took care of the Spurs last night, beating them handily despite trailing by 13 points in the first half. Paul George scored 28 points to lead all scorers in the 111-100 victory as he continues to make a cause for the early season MVP. The game against OKC will be the last game in a five-game road trip for the Pacers, a stretch where they have gone 3-1. A victory against Oklahoma City will be a tough task as the Thunder have yet to lose a game at game at home this season. OKC bounced back from their only defeat in the last nine games on Friday with a 109-95 win at New Orleans on Friday night. On their home floor, they are 9-0 this season and beating teams by more than 13 points a game on average at Chesapeake Energy Arena. There is no doubt the Thunder are one of the best teams in the NBA at feeding off their own crowd, and I have no doubt they will put up a solid performance tonight. The question is will it be enough to beat the league’s best team? Indiana is far and away the most complete team so far and are consistently in games until the final buzzer because of their championship level defense. Five points are a lot to give up in a contest that may be so close when it comes down to the wire. If any team can shut down Westbrook and Durant in stretches, it is going to the Pacers. They have lost just two games this season, who is to say they do not come out with a victory let alone cover the number? Kobe Bryant’s return is finally upon us as the hype-train will finally stop this Sunday in Los Angeles. The Raptors are visiting the Staples Center this Sunday and will do their best to take of the Lakers and ruin Kobe’s homecoming. After starting the season in a funk, Los Angeles seems to have regained their stride as Bryant’s return has gotten closer. They have won six out of their last eight games and are now 10-9 since Nov. 17th after starting the season 4-7. Pau Gasol and Jodie Meeks led Los Angeles in scoring with 19 points in a 106-100 win at Sacramento on Friday. Steve Nash, the other injured player in the Lakers backcourt has not yet returned. He is recovering from nerve damage in his back and will still likely be out another week or so. He is doubtful to play in today’s contest. The Raptors come into this game in bad shape. They have lost two out of their last three games on this road trip and are mired in a longer six-game losing streak. Rebounding has been a problem for Toronto due to the lack of size in their frontcourt. They were heavily outrebounded in a 106-97 loss at Phoenix on Friday, despite big games from Rudy Gay and Amir Johnson. The loss dropped them to 6-12 on the year. There is no question the Raptors are bad and the Lakers match up against them well, but I am not interested in this point spread in this one. The true play in this game is the total which is much too large. 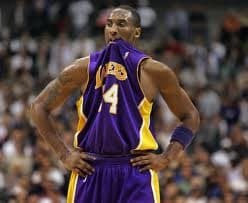 NBA teams learn to play together for weeks and Kobe’s insertion into the starting lineup is obviously an excellent thing for the team, but they may need time to gel first. He will not get a full complement of minutes in his first game back, but will demand the ball when he is in the game. This slows down the offense all-together keeping the point total down. Toronto has their own issues with scoring anyway, so they just need a little bit of help. Defensively, this is a nightmare game for the Raps, but they should get up for a game with some actual meaning and try to spoil Kobe’s homecoming.